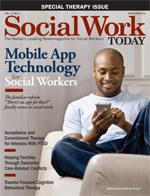 There will never be an app that does social work as we know it, but there are apps that may help social workers and other clinicians work more efficiently and effectively. The use of mobile technology in healthcare has secured a foothold. But while opportunities exist for social workers to adopt these technologies in their practices, acceptance has been slow. The reluctance is not surprising as the foundation of social work is built on human interaction. But the research and experience thus far indicates that mobile application technology has the capability to support the social worker-client relationship. This category of apps is also proving helpful for today’s social work students. “For recently graduated social workers prepping for licensure, the exam prep apps out there may prove particularly useful,” says Jack Monell, PhD, an assistant professor of justice studies in the department of social sciences at Winston-Salem State University in North Carolina. The University of Southern California School of Social Work has taken it a step further and recently introduced a new mobile app that allows students to access multimedia course content and intraschool social networks via their smartphone. It’s believed to be one of the first efforts to include comprehensive access to recorded lectures, course content, videos, and social networking features through mobile app technology. There are many other purposes for apps beyond quick references or data tracking. Some social workers may find it useful to introduce apps into an actual session though the idea of introducing technology during a session may seem uncomfortable at first, Smyth says. She adds that any social worker who has had a cell phone ring during a session may be inclined to think of technology as more bothersome than helpful. Clients who struggle with some addictions may have something to gain from the use of mobile application technology. But like any other technology introduced into the social worker-client relationship, mobile apps for addictions are not meant to replace in-person treatment. Many of the apps dealing with addiction focus on antianxiety methods of coping with withdrawal symptoms rather than the actual behavior cessation, making it even more important that face time with a clinician or support group is not ignored. But mobile apps can be an excellent support in between sessions by helping a client with meditation or relaxation techniques to deal with the difficult quitting process. While it seems that apps can be a supportive tool, clients may have trouble finding ones relating to alcohol addiction. A search of the Apple iTunes Store revealed that it was easier to find apps for drinking games rather than apps available to help with cessation. Apps for smoking or gambling cessation were more easily located. Amy Cohn, PhD, an assistant professor in the departments of mental health law & policy and criminology at the University of South Florida, has been studying the use of apps for alcohol addiction and surmises this may be because, traditionally, treatments and research for alcohol users have been directed toward individuals with a more severe clinical presentation. Cohn says since mobile app technology is already being implemented in other forms of healthcare, it’s only a matter of time before it “catches fire in the alcohol treatment field.” Still, like Monell, she does not believe that app technology will replace the clinician. “App overload” is a concern with the introduction of mobile technology, a phenomena related to the sheer number of apps on the market (currently about 500,000). Weeding through apps can become cumbersome, so clinicians must be careful not to introduce so much mobile app technology that it becomes a time drain.